Also serving communities of Cleveland Heights. There are 3 Memory Care Facilities in the Cleveland area, with 2 in Cleveland and 1 nearby. The average cost of memory care in Cleveland is $4,035 per month. This is lower than the national median of $4,650. Cheaper nearby regions include Rocky River with an average starting cost of $3,262. Caring.com has helped thousands of families find high-quality senior care. To speak with one of our Family Advisors about memory care options and costs in Cleveland, call (855) 863-8283. 13 percent of Cleveland's population is aged 65 or over, and more than 220,000 people in the state of Ohio are living with Alzheimer's disease. To accommodate these seniors, the Cleveland area offers 18 memory care facilities to choose from. 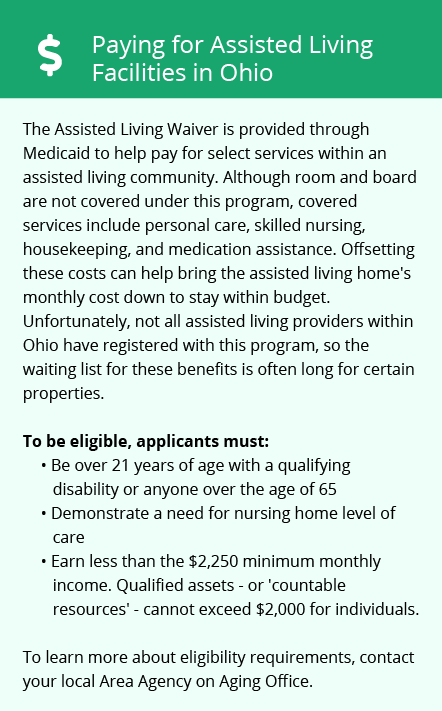 These facilities are licensed and regulated by the Ohio Department of Health (ODH) and are commonly referred to as residential care facilities (RCFs) within the state. Violent crime rates in Cleveland are more than 400 percent higher than the national average, and while slightly better, property crime also happens more than twice as often as the rest of the country. While living in a secure memory care facility can decrease the risk to seniors, visiting friends and family members may have concerns about their safety. Cleveland is home to world-class medical facilities, including those specializing in brain health and dementia care such as The Cleveland Clinic, in the event of medical emergencies or illness. The cost of living in Cleveland is 12 percent lower than the U.S. average, which means seniors on a fixed income should have more wiggle room in their budgets. While much of these savings can be attributed to the very low housing costs in the city, health care costs are on par with the national average, which can help keep expenses associated with memory care down. The cold winters and lake effect snow can be difficult for seniors to handle, but Cleveland does offer mild summers, averaging in the low to mid-70s for those who are more sensitive to heat. Cleveland gets an average of 61 inches of snow per year, compared to the national average of 26, which could be a concern for seniors who like to go on supervised outings or who have family and friends visiting regularly. Memory Care costs in Cleveland start around $4,035 per month on average, while the nationwide average cost of memory care is $4,799 per month. It’s important to note that memory care rates in Cleveland and the surrounding suburbs can vary widely based on factors such as location, the level of care needed, apartment size and the types of amenities offered at each community. Learn more about these programs, plus who’s eligible, on our Memory Care in Ohio page. For more information about different ways to finance memory care, visit our Memory Care in Ohio page. Cleveland and the surrounding area are home to numerous government agencies and non-profit organizations offering help for seniors searching for or currently residing in an assisted living community. These organizations can also provide assistance in a number of other eldercare services such as geriatric care management, elder law advice, estate planning, finding home care and health and wellness programs. To see a list of free memory care resources in Cleveland, please visit our Assisted Living in Ohio page. 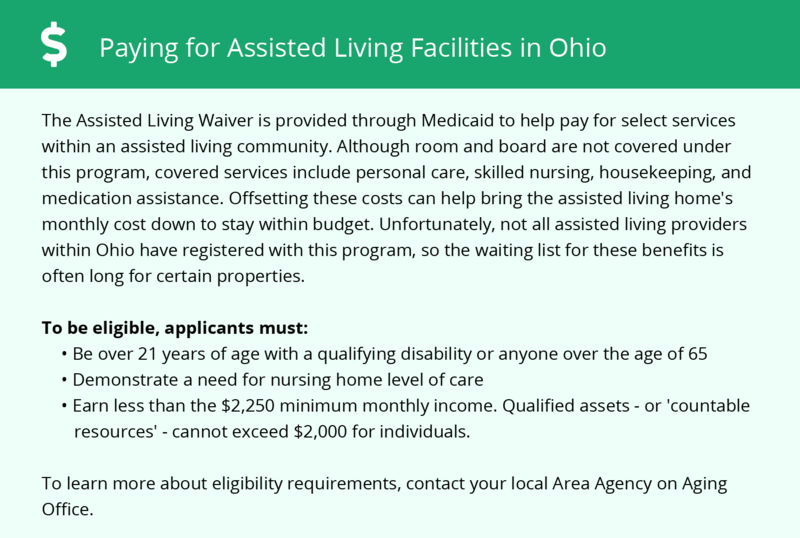 Cleveland-area assisted living communities must adhere to the comprehensive set of state laws and regulations that all assisted living communities in Ohio are required to follow. Visit our Memory Care in Ohio page for more information about these laws.